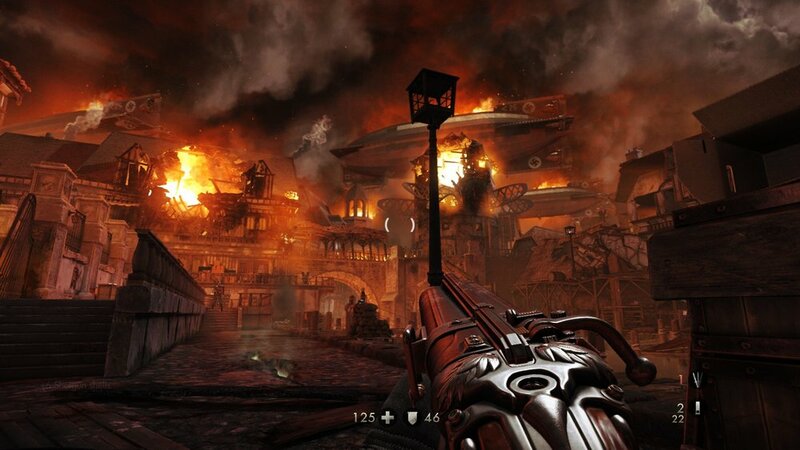 The Old Blood was entertaining; I won’t deny that. But it feels like it belongs in 2003. It isn't old school enough to have the charm of 90s shooters, and isn't as forward looking as the shooters of 2004/2005 were. It's somewhere in the middle, where I don't think anyone would want to be. The combat in The Old Blood is simplistic in a way that starting to feel unacceptable. I’m glad it isn’t Call of Duty, where the action is only slightly more sophisticated than Operation Wolf. But this is way behind F.E.A.R. and Crysis 1, which are still unmatched in “realistic” singleplayer FPS combat. The problem in Wolfenstein is that enemies aren’t capable of doing anything interesting. They run at you and sit behind cover, but don’t do much beyond that. This crude system works against the weaker enemies, who go down in 1 hit. But more powerful enemies provide the least interesting challenge possible, as all they do is take more hits to die, as if this was an RPG. This kind of design feels like the videogame equivalent of a Steven Seagal movie. Films where you can’t even expect to see interesting action choreography, let alone a good story. Speaking of the story, The Old Blood doesn’t do much of anything interesting. You’re on a mission to retrieve some documents, and on the way to them you have to murder hundreds of Nazis and their pets. This story lacks the surprising humanity and warmth that The New Order exuded during its quieter moments. I guess because it’s a prequel, there was no room for any character development at all, as that was all present in the original game. You do meet some characters, but they don't get much room. It's only been a couple hours since I finished the game, and I can hardly remember any of them. I don’t know what it is with ID Tech 5, but it seems to encourage the kind of art direction I enjoy. I played the DLC for The Evil Within just before diving into this, and as both use the same engine it was nice seeing the same qualities reflected in both. The use of lighting and color great. Even if the textures might look a bit rough, the whole is greater than the sum of its parts. The result is an image that looks almost better than it “should”. Word leaked a while ago that a sequel is in the works. I hope they aim a bit higher than “the same, except better looking”. I mean I had reasonable fun, even if the story had loads of logical inconsistencies, and things like the climbing and swimming irritated me to no end. I just want more. I shouldn’t be thinking back to something I played in 2005 wishing I was playing that instead.